To continue our fun with color we played with shaving cream paint! Not only is it fun on so many levels, it’s a perfect medium to use when exploring color mixing. The texture of the shaving cream allows kids to truly see how two primary colors become one. To make shaving cream paint you add a couple drops of food coloring to a mound of shaving cream and stir them together. 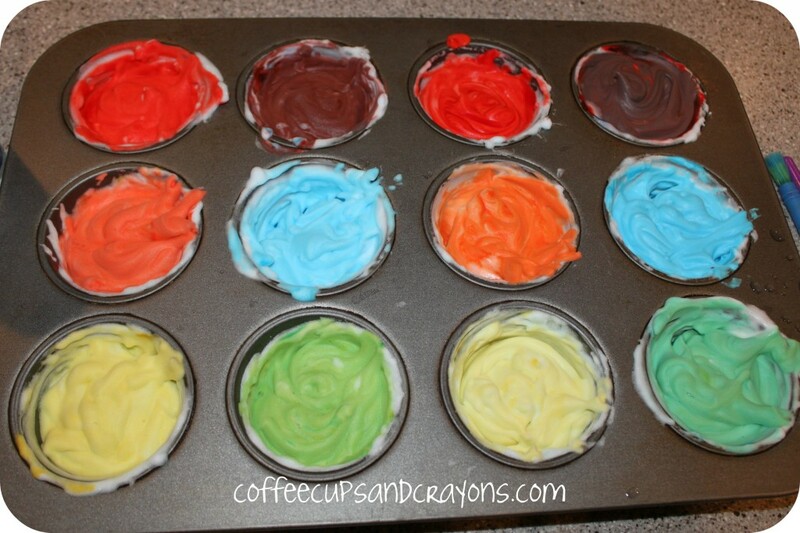 We mixed ours in a muffin tin so each secondary color was in between its parent primary colors. We had 3 kids painting so we made a double batch of each color. (Don’t worry in real life the colors looked much better…although the purple was a little on the brown side.) 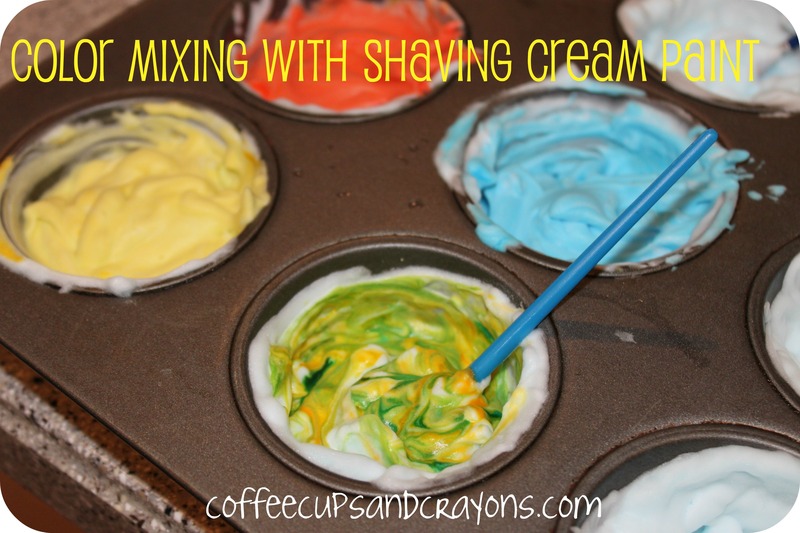 The kids loved mixing the colors and really enjoy the texture of the shaving cream. Once the colors were mixed they went to work! The almost 4 and 6 year old immediately wanted to paint rainbows with all the colors we created and then covered the rest of the shower in pictures and colors and handprints. My 2 year old had fun painting herself. And the walls. And the floor. The great thing about painting with shaving cream in the shower is that you can make as big of a mess as you want and all you have to do is rinse everyone and everything off. It’s the perfect place for painting. This is a great idea! 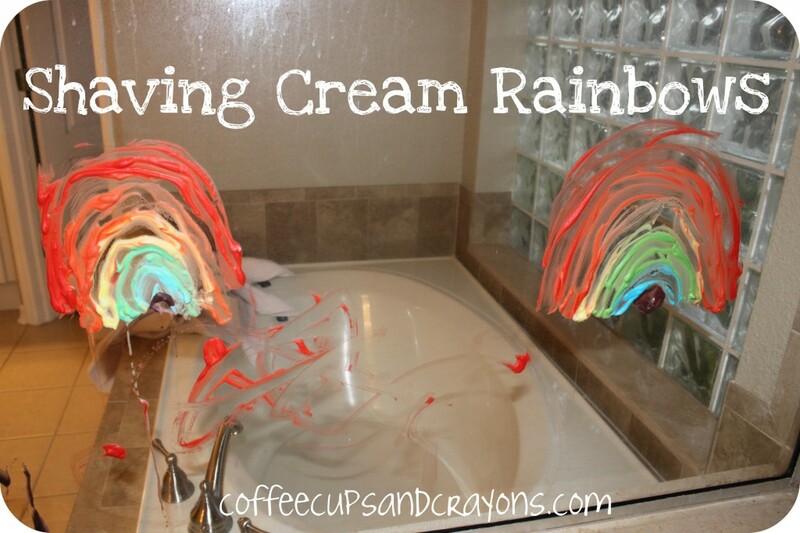 I haven’t done any shaving cream crafts yet- But I need to change that! I love the mirrored rainbows! I just did this with my son. we used paper because the weather isnt letting us go outside and used paddle pop sticks instead of brushes. Next time we might paint leaves. He loved mixing the colours into the shaving foam and getting messy.